Vietnam is no doubt a heaven for food lovers. If it's your first time here, make time to try Bun Cha, a succulent dish that is flavourful and comforting originally from Hanoi. The dish comes with a generous serving of white rice noodle (bun) together with grilled pork (cha) patties and pork belly garnished with greens and herbs with a dipping sauce. The smokey scent of pork belly and savory pork patties formed from a mixture of minced pork, garlic, shallots, sugar and fish sauce were grilled in coals until they are caramelised. 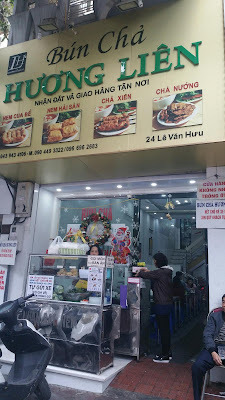 We got to experience this at Huong Lien at 24 Le Van Huu street, Hai Ba Trung district which becomes more famous after former US President Obama together with Anthony Bourdain visited this store on May 23, 2016 during his three day business trip in Vietnam. Hence #obama #Buncha was born. 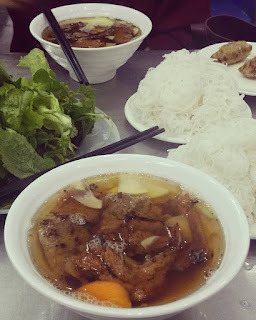 In my 4 days stay in Hanoi primarily to experience an authentic Vietnamese wedding through my colleague, I have eaten bun cha twice. Although there are a variety of foods to explore, but bun cha is so tempting and definitely worth another try.